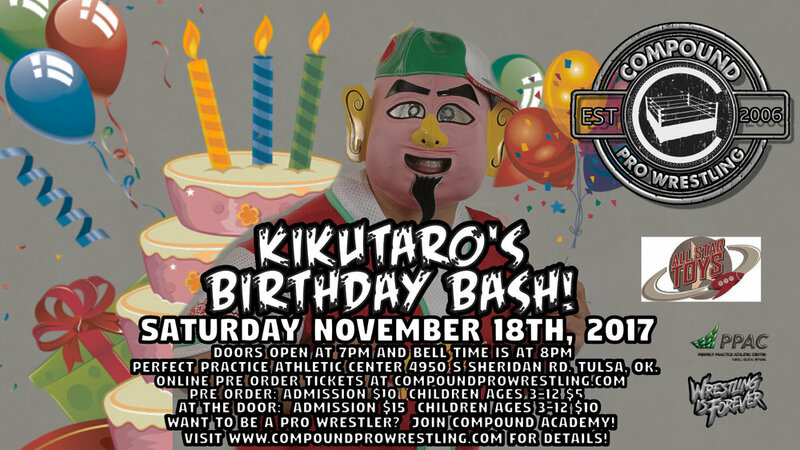 Saturday October 28th, 2017: Kikutaro's Halloween Bash! At 7PM is your chance to MEET Ring of Honor Superstar Beer City Bruiser and Kikutaro! At 7PM is your chance to MEET former WWE Superstars Kenny & Mikey of The Spirit Squad and Ring of Honor Superstar Colt Cabana! Tag-Team Seminar for The Spirit Squad (Kenny & Mikey) on Saturday October 21st, 2017. The Spirit Squad will be showing you all kinds of different techniques with Tag-Team Wrestling and lots of ways of dealing with the psychology of Tag-Team Wrestling as well as teachings from WWE's developmental programs such as Ohio Valley Wrestling and The WWE Performance Center! To be in the seminar, you must be a trained professional wrestler or training to be a professional wrestler from a reputable professional wrestling school. You must purchase this seminar in advance right here to attend the seminar. No walk ups. At 7PM is your chance to MEET former WWE superstar Jesús "Ricardo" Rodriguez and Kikutaro! At 7PM is your chance to MEET Lucha Underground star Son of Havoc aka Matt Cross! At 7PM is your chance to MEET Global Force Wrestling star DJZ! At 7PM is your chance to MEET former ECW Superstar Sabu! At 7PM is your chance to MEET former Lucha Underground star Matt Cross aka Son of Havoc! At 7PM is your chance to MEET former Lucha Underground star and Pro Wrestling Guerrila star Joey Ryan! At 7PM is your chance to MEET former Japanese Wrestling Superstar Kikutaro! At 6:30PM is your chance to MEET former WWE Superstar Jack Swagger! $10 for a picture using your camera. $10 for an autograph per item (includes a free 8x10 photo). Or $15 for a picture AND autograph!!! To purchase your Front Row Ticket, click here. To purchase your General Admission Ticket, click here. Seating is limited so be sure to purchase your tickets now before they sell out! At 7PM is your chance to MEET former Matt Cross AKA Lucha Underground star Son of Havoc! At 6PM is your chance to MEET former WWE Superstar Simon Grimm FKA Simon Gotch!